BELGRADE (Reuters) - "Serbia has dropped its opposition to an international dialing code for its former Kosovo province, a Serbian official said on Monday, in the latest concession by the Balkan country as it seeks to start membership talks with the European Union. The deal was reached in talks stemming from an historic accord struck in April to settle relations between Serbia and Kosovo five years after the mainly ethnic Albanian territory declared independence with the backing of the West. The launch of EU accession talks with Serbia, penciled in for January, is contingent on implementation of the accord. In a statement issued late on Sunday, EU foreign policy chief Catherine Ashton, who has been mediating talks between the prime ministers of Serbia and Kosovo, said they "reached an agreement on telecoms and energy", but gave no details. On Monday, Serbia's Minister for Kosovo said Kosovo would be able to apply for its own international dialing code, removing one of a number of complicated and costly problems facing the territory since it broke away in a 1998-99 war. The code will be +383. 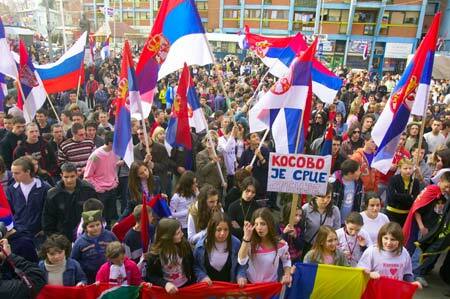 "Serbia will give the country code to Kosovo, and it will be in place by 2015," Aleksandar Vulin told Serbian television. Kosovo's landline network still uses the Serbian +381 prefix, while two mobile networks operating in the young country operate on the dialing codes of Monaco and Slovenia. Kosovo has been recognized by around 100 countries, including 23 of the EU's 28 members. But Serbian ally Russia, a veto-holder in the United Nations Security Council, stands in the way of U.N. membership, complicating issues of recognition on the international stage. Vulin said Serbia had secured the right for its own mobile providers, including state-run Telekom Srbija, to operate in Kosovo. He said the two sides had also agreed on the status of a small hydropower plant and two grid stations in northern Kosovo, a Serb-populated area that remains largely beyond the control of the Kosovo authorities. Details of the agreement were patchy, with EU officials declining to get into specifics. Kosovo officials could not be reached for comment. A number of previous agreements, reached in principle between Serbian Prime Minister Ivica Dacic and Kosovo's Hashim Thaci, have subsequently run aground in technical discussions. Bowing to EU pressure, Serbia has urged the ethnic Serb minority in Kosovo to take part in November 3 local elections, but it remains to be seen whether they will heed the call. Even if EU accession talks begin in January, Serbia is unlikely to join before 2020. But the process would help drive reform and lure investors to the largest of the seven states carved from the remnants of federal Yugoslavia in the 1990s."